Property 13: Dina Apartment: House on the beach of Kaminaki! Air-conditioned and with big private terrace. Property 18: Apartments with pool "Adonis"
Property 35: THE MAYFLOWER STUDIOS - EVERYTHING YOU NEED FOR A RELAXING HOLIDAY ! Lidovois comfortable upper floor apartment with great seaview on Pelekas Beach. Property 36: Lidovois comfortable upper floor apartment with great seaview on Pelekas Beach. Lidovois comfortable upper floor studio with great seaview on Pelekas Beach. 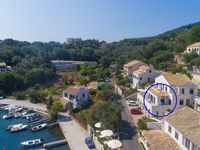 Property 37: Lidovois comfortable upper floor studio with great seaview on Pelekas Beach.